Thirty-five years after this article was published, Agnes Northrop (1857-1953) created one of Tiffany’s most extravagantly gorgeous landscapes, using elaborate layering techniques developed by Louis Comfort Tiffany (1848-1933) over his long career. In the reproduction of the beautiful, Art has occupied itself chiefly with form and color, and has seldom made more serious demands upon light than to ask enough of it to reflect its achievements in these two directions to the eye of the beholder. So keen is the pleasure derived from well-adjusted proportions that our statuary and architecture please by their appeal to this one sentiment alone. When color joins with represented form, our delight in these harmonies is sufficiently complete to exclude for the time any sense of deficiency. We believe ourselves to be quite satisfied. And yet, when we turn from these clever reproductions to the veritable nature of the outward world, or of our own unmaterialized fancies, our copies seem poor things after all. At best, they are so inadequate that one almost feels that the attempt is a mistake. The marble figure lacks the divine life that suffused and made adorable the human original. The painted atmosphere has not the spiritual light and transparency of the real heavens. The aureole encircling the sainted head does not palpitate with the living fire that glows in every sunbeam. Some element there is in nature’s beauty that art has failed to catch. It may be, that in attempting to give permanence to impressions which are essentially transitory, a certain violence is done to the constitution of things, which we resent even while we admire. The beauty is too permanent. It is not one with the passing, ever-changeful moods of Nature. We must not, however, be too exacting and demand the impossible. It is not to be expected that the pupil will equal the master. But the question is not unreasonable as to whether Art can not import into her work some of the life and the eternal ebb and flow which characterize that world of beauty which it is her province to attempt to reproduce. Form and color are large elements, but they do not make up nature. There must be light and motion, else the scene is deficient in its chief charms. True, it is impossible to realize motion in very fact : the strained muscle and unstable poise can only suggest it. Nor is it possible, working with marble and canvas, to realize the life and light of the real ether. This is something too subtle to be simulated. But it may be borrowed. By giving expression to his conceptions in translucent materials, the artist may so strain and filter the sunlight that it shapes itself at his bidding into such pictures as he will. And the beholder, seated on his bench before it, or perhaps kneeling in a reverential mood, loses himself in this fine vision, and under its influence sends out his thoughts over broader ranges and higher planes. I remember distinctly, as a child, the keen pleasure I used to get from a picture-window that faced me during afternoon church. It was a poor thing, artistically — Zaccheus on the bough of a very inadequate-looking sycamore-tree, with a passing multitude of such dimensions as to make tree-climbing seem absolutely superfluous — but in the early winter twilight I found the picture very beautiful. When the increasing darkness had softened the group in the foreground into a pleasant harmony, there was a strip of sky along the horizon that sprang into glowing life. And in that bit of light I used to wander over the Judean hills in happy abstraction until the music and the benediction called me back again to the more prosaic life of an American city. It is this added element in glass that makes it so fitting a material for the expression of artistic conceptions. It is a sensitive vehicle for the carriage of a beautiful thought. The material possesses a wealth of the purest color; it permits in its shading the accurate representation of form, and it furnishes something that marble and canvas do not — large possibilities in the way of light and of effective changeableness. These considerations are attracting the attention of artistic people, and probably in no other field is there better work being done to-day. It is true that the material is fragile — very fragile — but then few works of art are fashioned with the idea of rough usage. If protected from mere mechanical injury, glass will outlast many forms of matter apparently much more robust. Particularly is it proof against that ever-present enemy, the atmosphere. Stone crumbles and decays, metals corrode, and pigments fade, but glass defies nearly every- thing but fracture. The few glass ornaments that have come down to us from the ancient world are in a state of superior preservation. Glass and terra-cotta, fragile as they are, seem better adapted than even tablets of stone for preserving the records of the past. Clay cylinders from Assyria, depicting the story of the garden of Eden, are a part of historical record still extant : the graven decalogue is no more. The subject of picture-windows is a very large one, since their fabrication demands the exercise of such diverse faculties. Viewed from either the artist’s or the technologist’s standpoint, it presents many features of interest. In our nomenclature we have permitted ourselves to fall into rather careless habits. The terms “painted,” “stained,” and “mosaic” glass are used indiscriminately to designate any form of window-glass work which involves color, but a moment’s consideration will show them to be far from synonymous. Some of our best effects are produced without the use of either paint or stain, and such windows have the advantage of a much greater durability. In painted glass the colors are produced by enamels fused to the surface of the glass by means of heat. In stained glass, a permanent transparent color effect is secured by the action of heat on certain metallic oxides applied to the surface as pigments; while in mosaic glass, pure and simple, the design is brought out by the use of shaped fragments of colored glass bound together by strips of doubly grooved lead. The manufacture of mosaic glass has attracted the attention of men of such ingenuity and taste that it deserves its rank among the fine arts. It has attained a degree of artistic perfection of which the earlier examples gave only sparing promise. In spite of the abandonment of paint and stain, the mosaic glass has been given greater variety and greater depth of color than at any time since the Renaissance. In its present form, the mosaic picture- window is a distinctively American product. It has been evolved here, and, though now somewhat copied in Europe, it is here that the process has reached its greatest extension and perfection. The history of its mode of becoming is both unique and interesting. It is one that could not have been written much earlier to advantage, for the material of which it is composed has only been gathering during recent years. Were this history to be unfolded logically, it would start with the first conception which shaped itself in the brain of the artist, and from that intangible beginning it would be traced through the colored sketch, the full-sized cartoon, the gradual replacement of colored paper by colored glass, and so on to the completed window ; but that would pre- suppose too much. It would take for granted that the artist in glass had only to catch his fine dreams of beauty, and that the material for their expression would be found at hand ready for his use. But such is very far from being the case. In this form of art-work the real struggle has been to make the material adapt itself to the conception it is intended to express. The struggle, however, has been carried on so cleverly and so successfully that the ultimate triumph is the more enjoyable for the prelude. It is more consistent, therefore, to consider first the technical part in the history of a picture-window, the production of that adroitly wrought and daintily colored material which has made the window possible ; and then, having won the material, to regard its subsequent disposition in producing the fine effects which make it so admirable. To describe every variety of glass utilized in a mosaic picture- window would be to describe nearly every form of glass known in the flat. In such a window, be it remembered, the entire picture, except the exposed portions of the figure, is brought out by the use of shaped fragments of colored glass ; and one can readily imagine that, as all possible subjects are chosen for such representation, all possible shades and combinations and effects are needed in the glass employed. Draperies, vegetation, architecture, sky, earth, air, and water, are all successfully depicted without the use of either paint or stain. Such windows, except the flesh portions, are true mosaics, and of the most brilliant kind. To accomplish these wonders the glass has been made in all the colors of the spectrum, and has undergone a thousand different transformations. The shapes have been no less varied than the colors. The so-called “jewels,^’ or pieces of richly colored glass, cut with facets after the manner of precious stones, have added immensely to the brilliancy of modern designs, and have been particularly effective when introduced as a setting or framework to a picture-window. They are imported for the most part from Germany. The greater part of the flat glass used, however, is made in the immediate neighborhood of New York, under the direct supervision of the art-workers who are to utilize it. I had recently the pleasure of going through such a factory in Brooklyn, probably the largest of the kind in this country, and it was a veritable chromatic treat to visit the store-rooms, for some five hundred different color combinations were recognized in stock. The mosaic ateliers of the Vatican contain, it is true, not less than twenty-six thousand different tints; but these, it must be remembered, are simply opaque enamels, while the glass mentioned is all easily translucent, and much of it is clearly transparent. In the manufacture of this glass the materials employed are much the same as in ordinary sheet and plate glass. It is a double silicate of lime and soda, the coloring being due to the addition of metallic oxides which are soluble in the fused glass. The materials needed for the basis are, as before, sand, limestone, and alkali. They are mixed in the proper proportions – that is to say, about thirty parts of lime and forty of soda to every hundred parts of sand — and are fused in fire-clay crucibles in the customary glass-furnace. The coloring matter is added at different stages of the process, according to the nature of the material. The mineral world has been pretty thoroughly ransacked to obtain the needed colors, and additions to the list are constantly being made as the result of further experimentation. Taking the colors up in the order of the spectrum, the violet shades are generally produced from manganese or from very small quantities of cobalt ; the deep blues, indigos, purple blues, and normal blues, from varying proportions of cobalt ; peacock-blue from copper ; the finest greens from copper and chromium; and the dull sea- water tint from ferrous oxide. The oxide of copper gives an emerald green. The yellows come from a variety of sources : the sesquioxide of uranium gives a fine fluorescent yellow ; the oxide of lead a pale yellow, and the oxide of silver, applied as a pigment to the surface of the glass, a permanent yellow stain. The higher oxide of iron gives an orange color, but, as it has a strong tendency to become reduced, it is necessary during the manipulation of the glass to keep some oxidizing agent present, such as manganic oxide. In the reds a number of excellent shades are readily obtainable. Manganese furnishes a variety of pinkish reds and pinks ; copper, in its lower oxide, the fine blood-red of Bohemian glass ; and gold, the deepest and most brilliant of all reds, the well- known ruby glass. This list, however, is but a fragment. It bears to the complete array of color at the command of the glass-worker much the same relation that an inventory of crude pigments would bear to the fine distinctions housed in an artistes color-box. It is only intended to give some little idea of the mineral bases utilized for their color effect. The fine gradations of color, and the rich and delicate tones, are the result of no such elementary chromatics. Many substances have joined their forces to produce these fine results. In many cases they have been obtained only after long experimentation, and have a corresponding value in the eyes of their discoverers. The magnificent window designed by Mr. John La Farge, which now faces the chancel in Trinity Church, Boston, owes the brilliancy of its peacock hues to the combined forces of some seventeen ingredients. This is an extreme instance of complexity, but it fairly represents the present tendency to secure a multitude of effects even at the expenditure of a multitude of agents. In addition to these metallic compounds a number of other substances are used to produce either colors or unique effect. A little carbonaceous matter yields an amber tint of very agreeable hue, while the opalescence now so much in vogue and so justly admired results from the presence of oxide of tin, arsenic, or lime, or from native minerals, such as fluorite or the cryolite now imported in such large quantities from Greenland. The superiority of American art-work in glass is largely due to the introduction of this effective opalescent glass. It was first used in this country about ten years ago, by Mr. John La Farge and Mr. Louis C. Tiffany. The idea is due to Mr. Tiffany, and suggested itself in the most accidental manner. His own collection of glass included several Venetian wine-glasses made of thin opalescent globs, as well as several of thin transparent ruby of the quality used in ordinary colored window glass. As a painter he was naturally keenly alive to all color effects, and could not fail to be impressed with the contrast presented by the two glasses. The opalescent afforded such varying and beautiful effects, and seemed to possess so many advantages over the ordinary transparent glass, that the idea flashed upon him that if the ruby glass could be made use of in windows, why could not the opalescent as well ? He decided at any rate to attempt its introduction. After long and careful experimenting he succeeded in obtaining a sufficient quantity of glass for the construction of a window. There were so many difficulties to be overcome, however, that for a time it seemed doubtful whether the glass could ever be largely introduced. That question has now been so far set at rest that the glass may be said to enjoy too great a popularity for its own good. Its reputation has been somewhat injured at the hands of enthusiastic glass-workers — ” glass sinners,” Mr. Tiffany calls them — whose taste in this direction appears to have suffered chromatic aberration. It is the apparent ambition of these people to combine the greatest number of colors in the smallest possible space, and the results have been unhappy to such a degree as to frighten more sober-minded lovers of beauty from paths so seemingly dangerous. This unfortunate craze, however, may soon be expected to spend itself, and the really artistic work in opalescent glass will suffer no permanent damage from the nightmares in color which now disfigure many even of our better-class tenements and hotels. But the glass-worker has only begun his work when he has the molten ” metal ” simmering in his crucibles. It must undergo many subsequent manipulations before it is available for the purpose of art. Some of these, from a technical point of view, seem retrogressional. It has been found that the rich color effects in glass of the middle ages are largely due to the imperfections in the material. Its lack of homogeneousness, its unequal thickness, and uneven surfaces contribute largely to its beauty. The modern product is too uniform to be brilliant ; it transmits the light with too great regularity. Intentional imperfections are, therefore, introduced into the process ; and the products, in consequence, are much more satisfactory to the artist. This work of individualizing the product has now been so far systematized that several special brands of art glass are’ recognized in the markets. The so- called antique glass, in both white and colors, is made precisely like the ordinary sheet window glass, except that the surface of the glass is made full of minute blow-holes, which produce almost an aventurine effect, and add greatly to its brilliancy. In the cathedral glass the surface is rendered wavy and uneven, so that the transmission of light shall be correspondingly irregular. In the flash glass ordinary sheets are covered with a thin plating of colored glass, a process which permits a very delicate color tone,, and materially decreases the expense, where a costly glass, such as ruby, is needed to give the color. But in mosaic work it is now generally preferred that the glass shall not be at all transparent, since the effect is much richer. The most of the glass is therefore cast, the process being a repetition in miniature of the casting of rough plate. The pots containing the molten colored glass always remain, however, in the furnace, and the “metal” is dipped out in small iron ladles. It is poured at once on a little casting table, and is smoothed out by means of an iron roller. The small sheets thus obtained are readily handled, and permit the use of the convenient rod leer. In this, the annealing process requires from three to six hours, and at the end of that time the sheets are ready for use. In case more than one color is to appear in the same sheet, the effect is obtained by mixing together several masses of differently colored and still plastic glass on the casting table, by means of a copper instrument not unlike a plasterer’s trowel. In this way three or even four colors are combined in the same piece of glass, and, though the results are always more or less experimental, artists have learned to adapt them to their picture-windows as well as to their geometrical designs. The workmen have attained no little skill in the art of mixing. They have learned to reduce the accidental element in this apparently hit-or-miss process to a minimum, and with a fair degree of accuracy to secure predetermined combinations. The mixture of blue and white translucent glass in particular is made to represent sky effects as naturally as if the colors had been laid on by an artist’s brush. It is true that this combination is prone to represent an August sky ; but this is not to be regretted, since at no other season of the year are the heavens more beautiful. By this mode of manufacture the glass has an unequal thickness and consequent varying depth of color that well adapt it for art purposes. For certain uses, however, particularly for drapery, the differences in color tone are still not sufficiently great, and other devices must be resorted to. A special product, known as drapery glass, has of recent years been added to the already ex- tended list, and produces a most excellent effect. While the sheet of glass on the casting table is still sufficiently hot to be plastic, it is seized by suitable tools, and rumpled up until it looks like a piece of crumpled cloth. It is permitted to cool in this condition, and, when introduced into a picture-window, presents a luminous substitute scarcely less natural than real drapery. One is almost tempted to run his hand over the folds to try their texture. It is by processes so painstaking and so ingenious as these that the material for our picture-window is won. The industry is still a comparatively new one, yet so marked are the improvements witnessed by the passing years that the artist is now almost un- restricted in making the design of his window. Should it contain any effects not expressible in materials already at hand, the deficiency is only an incentive for further effort, and the needed material is pretty sure to be speedily forthcoming. So much for the body of our window : the soul of it comes by a less visible process. In some quiet moment, under the influence of a strong sentiment, or in the face of an inspiring vision, a suggestion of beauty is evolved in the artist mind. Why it comes in one brain rather than in another it would be difficult to say. Whether it is the result of some subtle chemical reaction in the gray and the white, or the incomprehensible force that has caused this reaction, it seems almost useless to inquire. But in some way or other the vision comes, and finds lodgment under a hospitable roof. It is entertained and communed with until it takes definite shape, and the conception is committed to paper. It is at first little more than a suggestion, a small colored sketch. If this prove satisfactory, it becomes the nucleus of a window, and undergoes its first metamorphosis, enlargement. From the beginning of its career until finally, after months or years^ the picture is in place and the bright sunlight illumines it, the different steps in the transformation involve never-ceasing care and thought. At any step a failure of attention might mean a total failure of the work. To follow this little sketch in its growth toward a window, will be to watch its fortunes under many different hands and under widely varying circumstances. As the Tiffany Glass Company of New York has been particularly successful in adapting the mosaic treatment to picture-windows, their studios furnish typical illustrations of the several steps. Ordinarily the artist simply furnishes the small colored sketch, and from this germ the window is evolved. Occasionally he goes a step further, and supplies a cartoon in white and white of the natural, size. It is only in rare instances that he does the full-sized sheet in colors. Not infrequently the suggestion for a window is taken from some celebrated painting or engraving. The Tiffany Company recently reproduced Gustave Dore’s famous picture, ” Christ leaving the Praetorium,” for a church memorial window, the entire piece being executed in pure mosaic, with the exception of the faces and hands. The dimensions of this truly magnificent work of art are twenty by thirty feet. It is the most ambitious window ever attempted in America, and, indeed, the largest opalescent piece in the world. In many cases, however, the suggestion comes from humbler sources. 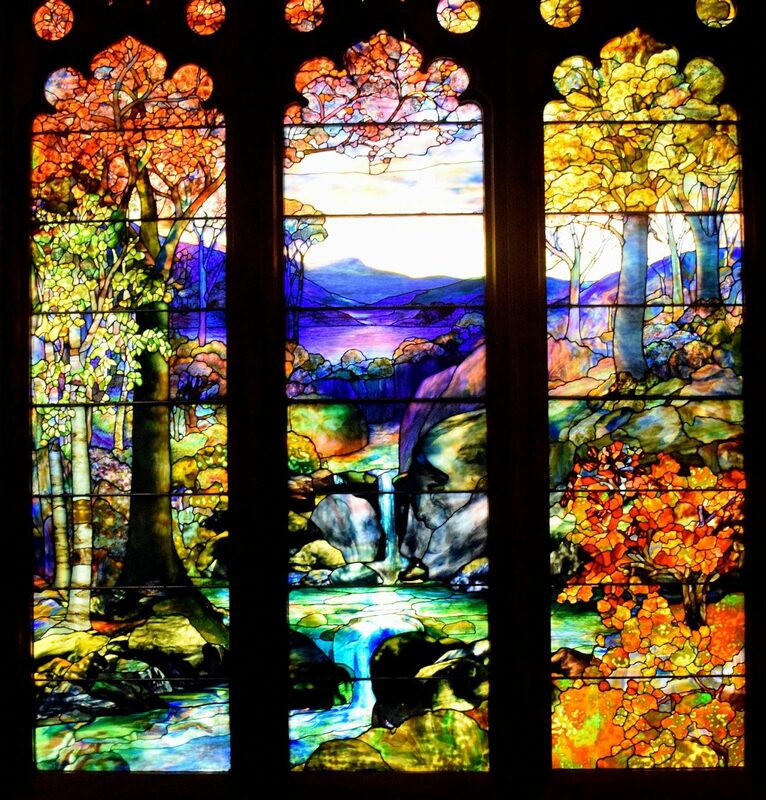 A very beautiful window designed by Mr. E. P. Sperry — ” Faith, Hope, and Charity ” — and recently completed as a memorial window for the Unity Church at Springfield, Mass., sprang from a thought suggested by a Christmas card. Where the design for a window is ordered and paid for by the purchaser of the window, it is of course impossible to secure a duplicate ; but where a picture that is already common property is reproduced, the work may be several times repeated. Thus ” The Good Shepherd,”‘ a very satisfactory figure of the Christ taken from the well-known painting by Frederick J. Shields, has been reproduced in glass three times, and now adorns as many churches in different parts of the country. It is too beautiful a conception to be rendered any less pleasing by this repetition. In all cases the patterns and other needed guides are pre- served, so that, should the occasion arise, a picture-window once executed may be readily duplicated. A window has just been completed for the Buffalo Cathedral, to take the place of one recently destroyed by fire. It is a very close duplicate of the original work. But while the success in reproducing pictures already extant has been very marked, a keener pleasure is de- rived from modern pictures designed originally for execution in glass. Many of these are exceedingly beautiful, and represent the thought of some of the best artists of the modern American school. The enlargement of the colored sketch to natural size is accomplished by women artists, who work standing before large sheets of heavy brown paper tacked against the walls of the studio. While this mode of procedure would in any case be necessitated by the large size of the cartoons, it has the independent value of permitting the progress of the work to be checked at all stages by long-range scrutiny. As much of the enlargement as possible is done mechanically, but at best there remains much free-hand work requiring genuine artistic feeling. Indeed, throughout the entire process, true artists are needed in the most mechanical portions to make the success of the adventure complete. When the enlargement is finished, the cartoon is divided up by heavy white lines so disposed as to represent the doubly grooved lead needed to hold the fragments of colored glass together. Sketch and cartoon are now taken to the glass store-room, and appropriate glass for the window is selected and laid aside. If suitable material is not found in stock, it is ordered in such quantity that the discovery of right effects may reasonably be expected. As the accidental element, in spite of all the skill on the part of the glass-worker, is necessarily large, it sometimes happens that a ton of glass must be searched over to find a few pounds of just the right sort. In some cases several months pass before appropriate material can be selected. The search for material ended, the work of construction may- begin. Two duplicate copies of the cartoon are first made. One operation suffices to accomplish this. The cartoon is laid on a. large table, and beneath it are two sheets of similar paper and two sheets of ordinary white transfer paper arranged alternately. By- passing a small revolving wheel over the outlines of the cartoon, the tracings are quickly and accurately made. Each space is then numbered correspondingly on both tracings, and one of them is cut up to make patterns for the glass-cutter. An ingenious dissecting instrument is used for this purpose. It consists of a pair of double-edged shears, which, in cutting, removes a strip of paper just the width of the lead which will separate the fragments of glass when they are finally bound together. In this way each pattern is precisely the size required. When the glass is ready to be put together in the window, there is very little coaxing to be done to get it into place. The picture-window has now reached the most critical stage in its development. The paper patterns are to find suitable counterparts in glass, and upon the nicety with which this substitution is accomplished depends the effect of the entire work. Nothing is left undone that will assist the glass-cutter in forming correct color-judgments. Throughout the entire process, and here particularly, the work progresses under precisely those conditions that are best calculated to make surprises and incongruities impossible when the whole shall be completed. A sheet of plain glass, the size of the cartoon, is laid over the undissected tracing. Outlines of the intended lead bands are then painted on the clear glass in white lines of corresponding width. On the model thus prepared the paper patterns are stuck by means of a little wax. It is now ready to be taken to the figure-room, where it is placed directly in front of a large window, and the slow work of substituting colored glass for paper begins. The position in which the completed window is to be placed must constantly be borne in mind, and the treatment adopted be made to conform to the requirements of light and neighborhood. A window that will be effective when seen against a clear northern sky will probably be somewhat dull if turned to some other point of the compass and seen against a dark background of brick walls and shadows, while a window that would be a delight under these more somber conditions would be insupportably glaring against the stronger light. Consideration must also be paid to whether the window is to be seen commonly at long or short range, and to the general color tone of neighboring windows and walls. Piece by piece the paper patterns are removed, and the shaped fragments of glass take their place. Each fragment is obtained by repeated trials until just the right effect is secured. When the fragment has been selected and shaped, it is also held to the sheet of clear glass by means of a little wax, and another paper pattern is removed, to be similarly replaced by glass. In this manner the removal and replacement go on step by step until the entire work is done. The colored sketch and the enlarged cartoon are always kept in sight, so that the spirit of the picture may be realized as completely as possible. The workmen who thus select and cut the glass have acquired a surprising skill in adapting its accidental variations to the needed expression of the thought. In many cases they entered the studio as boys, and have been slowly trained to perform this difficult work with much nicety of judgment. In mosaic glass of purely geometrical design, the requirements of color harmony alone need attention: but in the picture-window, in addition to this, a very appreciative eye is needed to seize upon just the right combinations to bring out the draperies and the background and the sky. It is frequently impossible to secure the desired effect with one thickness of glass, and the custom of doubling the glass is becoming more prevalent each year. This practice gives both better drawing and deeper color. In the matter of draperies, particularly, the method leaves little to be desired. In the window representing ” Faith, Hope, and Charity,” the draperies of the three figures were executed in white opalescent glass, and the dainty shades desired — pale green, pink, and yellow — secured by placing back of this, fragments of plain glass of the proper color. The effect could scarcely have been more delicate, yet the color tones were full and strong. In another window, the design of Mr, Will H. Low, the draperies of a seated figure were executed in a vivid blue. The sketch called for a rich purple, and any one passing through the studio at this stage of progress would have been inclined to resent the seeming liberties taken by the workmen. The artist’s intentions evidently were only half carried out. But, while one stands pondering over the excessive amount of assurance possessed by people of a certain class, one of their number has quietly slipped a piece of ruby glass back of the draperies, and at once the vivid blue vanishes to give place to a magnificent purple as much finer than the artist’s paper-color as the sunshine is better than gas-light. In this plan of doubling the glass the colorist has in his possession a device of immense effectiveness. The entire color tone of a window can readily be -changed, even after it is completed and in place. When the window is well under way, the preparation of the flesh portions of the picture begins. These are cut from white opalescent glass, and must be painted with no inconsiderable skill. In the early days of mosaic glass the painting was done almost in monochrome, a light reddish brown being a favorite tint. It had, however, the disadvantage of giving a statue-like sameness to all the figures. Had the taste continued, our windows would have become an assemblage of rather monotonous blonde types. But to-day there is great variety in this respect, and the painting of the face and other exposed portions of the figure is made to con- form very strictly to the character of the whole picture. In ecclesiastical designs done in mediaeval style, the painting is executed in a pinkish-brown monochrome on transparent antique glass. The effect is so very Elizabethan that it is hard to believe the work a modern product, unless one has seen it in process of evolution. For the saints and Madonnas of the early masters, the high cheek-bone and other characteristics of feature are reproduced with remarkable fidelity. But, while these products are highly interesting, they are in point of beauty far excelled by modern types. To the production of these nearly the whole range of mineral paint has contributed. One of the finest examples of the modern school of painting on glass is to be found in the face of ” The Good Shepherd,” in which nearly every possible color has been used. At a distance one is not conscious of any particular color, but is attracted by the intense life and love shown in the face. Rather bold expedients are often employed to secure these striking effects. In one face, whose eyes were more than usually expressive of life, the result was obtained by bands of bright green bordering both eyelids. It is by the expenditure of such care and labor that the soul and body of our picture-Window are brought together ; but, before the union is made permanent, the window undergoes a searching art scrutiny, and any changes are suggested that would add to its beauty and harmony. In some cases all the combinations have proved so fortunate that very few changes are needed ; but the case is not always so easily disposed of. It happens at times that portions of the glass must be recut several times before the de- sired effect is secured ; or, even after the window is completed, the discovery is sometimes made that a different background would have been more effective in bringing out the figure. Such was the case in a Jeanne d’Arc window designed by Mr. Frank D. Millet. The substitution of a light for a dark sky brought the figure into much finer relief. When, finally, the effect is considered satisfactory, the fragments of colored glass are removed one by one from the sheet of clear glass, and are skillfully bound together by means of strips of doubly grooved lead. This requires some very nice soldering. When it is completed the lead is tinned in order to protect it from the atmosphere. The spaces between the glass and the lead are then filled with a composition of putty and lead, which sets very rigidly, and serves the double purpose of making the window perfectly water-tight and of preventing any looseness on the part of the fragments of glass. There remains only the provision of a strong, iron-bound frame, and the picture-window, after a development covering many months, is ready to be put in place. The materials for its manufacture have been gathered from many sources, and the skill of many hands and brains has united to bring them into suitable community. The functions of artist and artisan have been fulfilled. Now they give place to the office of the critic. To one who is familiar only with the chromatic efforts of the “glass sinners” this praise may seem extravagant; but, as we love painting in spite of some pretty poor chromos, and statuary in the face of popular domestic groups turned out by the gross, so is it possible to warmly admire the window of real merit while we deplore its unhappy imitator. At its best one can imagine few objects more beautiful. The varying light and the purity of color in art work of this character are a source of lively pleasure. They appeal to a sentiment which, when present at all, is apt to be a dominant one. Those who entertain it turn away regretfully from so beautiful and so luminous a picture.